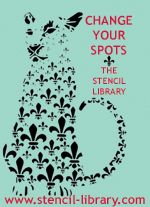 Learn to stencil in a lunch break! Jennifer Randolph (left) and Helen Morris. Some of my tips and tricks for successful stencilling are featured in a series of 'how to stencil' video tutorials produced by Stencil Ease, USA. Stencil Ease has a licence to make and sell some of our stencils to their customers in the USA and I went their HQ in Old Saybrook, Connecticut to teach a few of their team my techniques for success with stencils. They made a series of videos charting the progress of me teaching Jennifer Randolph my method of stencilling. They are free to view on Stencil Ease's YouTube channel. This is not a slick set of videos, they relay real situations as Jennifer encountered them, she asks the questions that any novice stenciller would, she makes mistakes and learns to correct them; it was genuinely exciting for me to watch Jennifer build her skills and many of the projects that I do later in the series are a team effort between her and me. In the first video, I show Jennifer how to use a stencil brush correctly, how to avoid paint bleeds and how to shade and blend colours through a stencil. She shows me how not to apply spray adhesive. There is a full-length (17 minutes) version of our lesson here or 3 separate shorter sections. There is another one which gets across the dry brush stencil technique pretty well in less a minute and no voice-over; You can find them at Stencil Ease's YouTube channel and I hope that they will be helpful to anyone else wanting to take their first steps towards using stencils for decoration. There are much more to come. If you would like to learn to stencil with me as Jennifer did I run classes at Stocksfield Hall in Northumberland, UK and I will be coming to teach 3 classes at the IDAl Convention in Greensboro North Carolina this October. I hear that Jennifer is doing extremely well without me now and her husband tells me that I have unleashed a stencil demon but I can only think that this will be good news. Jenifer is very creative and designs clothing so I am really excited to see what she may show us in the future. STENCIL TECHNIQUES WITH TOUR (full day class including lunch and materials) £75.00: Saturday 23rd September This class gives a good base to develop stencilling skills along with plenty of inspiration for using them. The day involves practical work, demonstrations and a visit to stencilled rooms at Stocksfield Hall. Students will learn to cut a stencil and experiment with different media and surfaces including fabric. Participants should gain confidence and skills to tackle larger scale projects such as walls, floors and soft furnishings. Students should leave with their completed samples and a starter kit worth around £30.00 which includes brushes and stencils. STENCIL TECHNIQUES FOR FURNITURE (full day class including lunch and materials) £95.00: Sunday 24th September Students will experiment with a collection of corners, borders, repeat and spot motif stencils to create panels, circlets and overall pattern. Special attention is given to corners, symmetry and contrast panels. Simple fantasy finishes will be demonstrated. Students will practice with paint and metal leaf. Many of the skills learned will apply to larger projects too. Participants should gain skills and confidence to customise pieces of furniture and other small scale projects. Students take home more than £50.00 worth of stencils and completed samples of work along with notes to accompany the class. There are two new classes on the weekend of 30th Sept and 1st October and they are a rehearsal for the ones that I will teach in the USA in October. The price will reflect the fact that they are both new classes, timings and projects may go astray a little. One class explores stencilling your own versions of Chinoiserie wallpaper and the other concerns stencilling on fabric....two of my favourite subjects. Details of both will be posted in a few days but you are welcome to contact me earlier if you would like.....that's if you haven't learned all you need to know from the video clips! The book is no longer available in the UK but there are several foreign editions including an American version. Amazon.com will post to the UK; All the books have different covers and different spelling but the content and free stencils are the same in all the publications. Most of the stencils featured in the Stencil It book are available for sale at The Stencil Library including the ones that we designed for the pages and did not make the final edit. I hope that the film clip and will help you get fabulous results when stencilling with paint and stencil brush, the book features stencilling onto other surfaces and contains tips on using stencil crayons, texture paste and spray paint along with the use of rollers and sponges. If you happen to be a UK stockist of Stencil It with some copies for sale by mail order let me know and I will put your shop details in the comment section.... I have no copies left. I am now on YouTube chatting about the Stencil It book and showing how to use a stencil. They are easy techniques to follow, one segment demonstrates free form stenciling and the other shows stencilling onto fabric. I think I look like I need a good scrub... and a good nights sleep. However, the stencil demonstrations come across well, there is lots of variety and parts of the stencilled house are shown. The film was commissioned by Jacqui Small, the publishers of Stencil It. Please visit and if you found the clip helpful or interesting maybe leave them a comment. Even better, please pass the link to anyone who may be interested. A short version of BBC Television's visit to The Stencil Library is now on line. It's just over a minute long and you will find it on Paul Paxton's North Country People BBC Look North. Look for the title 'Stencil Makers'.